THE MILLENNIUM DAWNS. Twin baby boomers anticipate freedom following kids and career. But there's a hitch. Mom and Dad are frail and fading fast. 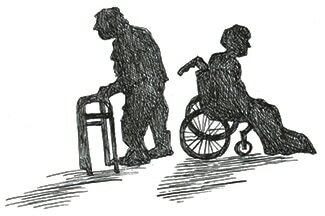 So Judi and Janet become caregivers, and journey with Betty and Fred to the end of their lives. Over a decade, the twins reluctantly accept that old age has no cure. As they strive for quality through every stage of dwindling, they sharpen their skills and hone new strengths. Both daughters and parents discover their deep connection and tenderness in the slow dance of caring and being cared for. Flashbacks enrich this impassioned story. The twins learn to recognise both excellence and imperfections in doctor's offices, emergency wards, dementia lock ups, assisted living and long-term care homes and hospices. They come to appreciate the challenges that all health systems are facing as they work to deliver high-caliber care at the edge of life. Some readers might ponder as they read this book, "What will happen when the boomer generation begins to dwindle?"